The global LNG-fuelled fleet is set to double by 2022, as demand for bunker fuel grows ‘significantly’, according to research by The Oxford Institute for Energy Studies (OIES). The board of directors of Russian national energy firm Gazprom has backed plans to support new LNG bunkering investment in line with expected growth in LNG consumption. LNG bunker vessel Coral Methane has completed its first ship-to-ship refuelling operation, in Tenerife in the Canary Islands. Following a tipping point for LNG as a marine fuel last year, industry demand is expected to increase sharply in 2019, according to multi-sector coalition SEA\LNG. Spanish fuel specialist HAM Group has opened the first LNG fuelling station in Extremadura, in western Spain. LNG equipment developer LIQAL has secured a contract for turnkey realization of an LNG refuelling station in Heverlee, Belgium. Fuel specialist Galileo has introduced the first fleet of LNG-powered t heavy-duty trucks in Argentina. The port of Rotterdam has introduced the first LNG-fuelled trailing suction hopper dredger to the Netherlands. Swedish shipping line Rederi Gotland has taken delivery of its new LNG-fuelled ferry – Visborg - in Sweden. Research consortium BioLNG EuroNet has announced plans to expand LNG infrastructure across Europe with investment in LNG trucks, refuelling stations and a BioLNG production plant. The Maritime and Port Authority of Singapore (MPA) is to ban open-loop scrubbers, providing a boost for LNG-fuelled vessels in the country. Fuel specialist Eagle LNG has completed first bunkering operations of the Taino, the world’s first LNG-powered combination container/roll-on, roll-off (ConRo) vessel. Australian oil and gas company Woodside Energy is reportedly planning to quadruple the size of its Pluto LNG truck loading facility, following the signing of its first customer this week. Sheffield Resources signed an agreement for the equivalent of five terajoules of LNG per day for 15 years as part of the Thunderbird mineral sands project. Woodside plans to expand its LNG truck-loading operations at Pluto to extend its virtual pipeline concept serving mines in the region. Authorities in India are to introduce close to 20 LNG fuelling stations on some of the country’s main heavy transportation routes next year, according to energy major Petronet LNG. Tenders are currently under consideration with the aim to establish a pilot project base of some 5,000 LNG-fuelled trucks travelling five leading national highways. “Following its successful experiment, this exercise would have a repeat in subsequent year of 2020 for another estimated 5,000 trucks that can run on national highways on LNG with a fuel cost saving of nearly 25 percent as well effectively addressing the issue of fuel pollution,” V. K. Mishra, director at Petronet, said. Indian manufacturers including Tata and Mahindra are also expected to produce LNG-fuelled vehicles and buses helping to drive demand growth. A study commissioned by industry coalition SEA\LNG has revealed a strong investment case for LNG as a marine fuel in the container shipping market. The research analyses usage for a newbuild 14,000 TEU container vessel operating on an Asia-US West Coast (USWC) liner routing and compares six fuel pricing scenarios. “The study unequivocally shows that for this vessel type, on this trade route, LNG as a marine fuel delivers the best return on investment on a net present value (NPV) basis over a conservative 10-year horizon, with fast payback periods ranging from one to two years,” Peter Keller, Chairman of SEA\LNG, said. 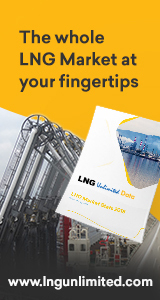 The study was produced by independent simulation and analytics firm Opsiana and indicates that LNG provides a greater ROI than alternative compliance solutions, including the installation of Exhaust Gas Cleaning Systems (EGCS), or scrubbers, across 5 out of 6 of the fuel scenarios explored. It also reveals a diminishing CAPEX hurdle, competitive energy costs, the stability of LNG pricing, and the realistic cost of scrubbers.